When arriving at the Bangkok international airport, one leaves the air-conditioned airplane into a wall of humid heat. It was 38 degrees C (100 F) in early June. One gets used to it quickly, but it sets the pace for the rest of the trip - leisurely walking is the only way to avoid breaking into a sweat all the time, and one contrives to stand near fans a lot. I arrived with no plans where to go next, so I had a hotel booked in Bangkok to get a feel for the country before I set off. This was unnecessary; Thailand is very well suited to just hopping on a bus or train and going off on a whim. I used a train from Bangkok's Hualamphong train station to Ayuthaya, the next morning; it would have been better to go there right from the airport. 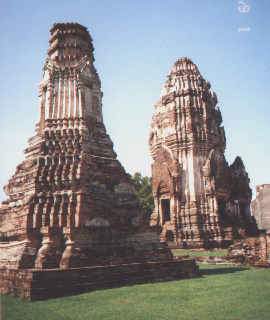 Ayuthaya was the capital of Thailand until 1757, but now it is just a large field of ruined wats like the one in the picture to the right, and at the top of this page. From the train station it's a short walk to the ferry, an old wooden pier with shaking stairs and a boat driven by an ancient open diesel motor. The town begins promising on the other side, but peters out very quickly, like a toy town built by a child with too much space and way too few houses. Nice wats, all ruins. I stayed for one night in the Wieng Fa hotel, not very fancy but not bad for a Thai budget hotel. A wat is a buddhist temple compound. There are wats in every village that are well-maintained and staffed by monks in their orange clothes. Cone-shaped chedis can be found in all wats, either in the pointy Thai style or the older rounded Khmer style. Almost all the wats in Ayuthaya and Lopburi are ruins. All the buildings in Ayuthaya and Lopburi are built from bricks and covered with plaster. Most of the plaster has fallen off, and the brick structures are not very well preserved - they keep crumbling, and some buildings are merely huge overgrown piles of bricks, like the temple behind the Buddha at the top of this page. In many cases, the ground the chedi was built on has sunk over the centuries, so that formerly straight floors now curve up and down, and many chedis are strongly leaning to one side. Khmer chedis like the ones in the picture have very steep stairs leading to a door. The inside is basically hollow, with a ceiling tapering to a tip. Originally, there were shrines inside, Buddha statues and sacrifices. It is possible to climb up there and look in but entering is difficult because of the stench of the bats that found a home in the dark caverns. 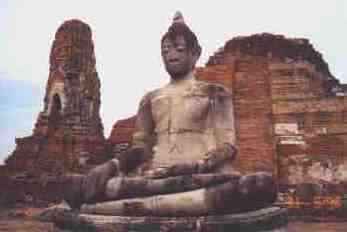 Wats also contain countless Buddha statues, all in one of the seven standard poses. They are usually covered with gold leaf, sometimes smoothly applied and sometimes loosely attached by worshippers; sometimes, if there isn't enough money, there is a single gold patch on the right breast. In the ruined wats, many statues are broken and headless. I took the train from Ayuthaya to Lopburi. Trains are very convenient, they run frequently and are extremely cheap. I went third class, which means benches running along the sides, fans on the ceiling, and open windows. Lopburi, unlike Ayuthaya, is a real small town with shops and markets, and much more interesting than Ayuthaya. Right across from the train station, there is a wat not unlike the ones found in Ayuthaya, where the picture on the right was taken. 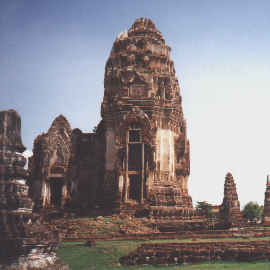 Lopburi also has an old palace, parts of which are in ruins and parts of which are still in use. They are all set in a large garden that is used by the locals as a park. Another wat is crawling with monkeys, who also run free in the town, looking for food. The little guy on the left was alarmed by the camera I stuck in his face. In general I'd recommend staying in Lopburi, not Ayuthaya. There may be fewer and less prominent wats but there is just more to do there. The next stop on many people's itineraries is Sukhothai, another former capital, but I decided not to spend another day looking at ruins so I went straight to Chiang Mai. (Looking back, a day in Sukhothai would have been better spent than a day on the southern islands.) I used a sleeper on the night train from Lopburi, lower berth, which is about the most expensive thing the railway offers (about $12). The beds are a bit short for a Westener (Thais are generally shorter) but comfortable. 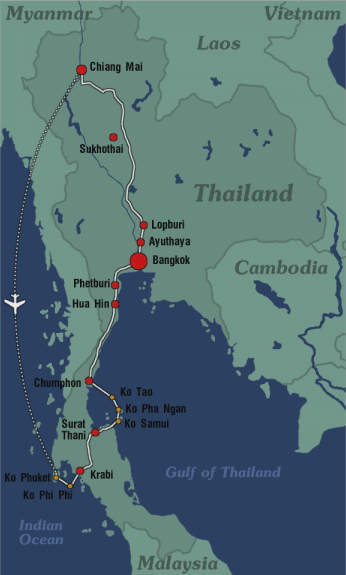 Earplugs made sleep possible; train tracks in Thailand are not continuously-welded and the wheels rattle. Anybody used to whispering European trains will be shocked by the noise! In second class it's bad; In third class it's deafening. Chiang Mai is a large city but much smaller than Bangkok, without the smog and the traffic chaos but with all the amenities. The picture on the right shows a typical side street - some old wooden buildings, many new concrete buildings, shops, market booths, and food vendors and little taxi cabs and people everywhere. Very few places in Thailand have that sparkling designed look of western shopping streets; people just use any space available and make do with what they have. Of course, Chiang Mai has its share of wats and shrines. 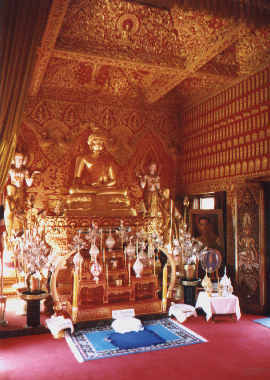 The one on the left shows the interior of the building that houses the Buddha shrine, with an especially elaborate ceiling. On the steps of the altar, smaller statues, burning incense, and offerings are placed. The rug in front is used by kneeling worshippers. To the right is a picture of King Bhumibhol of Thailand, who is greatly respected in Thailand and whose picture can be found everywhere. As I write this, I sit in the hotel garden by the pool under palm trees, watching the boats on the Maekong river which flows through Chiang Mai. If you can afford B1800, stay at the River View Lodge. They took care of my excursion plans and flight arrangements, and when the hotel's excursion offers didn't quite meet my expectations they found another agency that had just what I wanted. Every once in a while I like to relax in a good hotel, avoiding all the hassles like cold showers and insects in the cheap ones, and the River View Lodge was one of these. 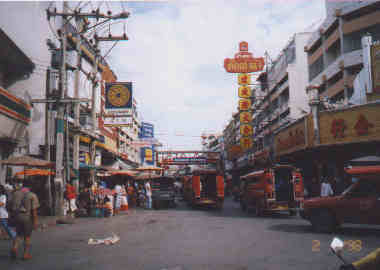 Like all towns, Chiang Mai has a variety of "markets", which are really bazaars of haphazard booths of all kinds, like in the picture on the left. 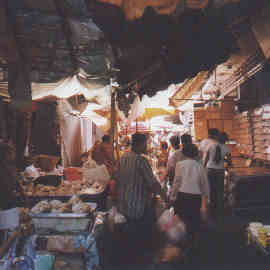 The typical booth offers food or clothes, but there are specialty markets too (in Bangkok there is a large "hi-fi market" where the stalls offer BNC connectors and little bags of transistors and cable drums and all kinds of other electronic parts!). In between there are food vendors, small carts with a display case full of meat and vegetable bowls, a gas cooker, and nicely arranged food. If you are so inclined, there is always a mini-mart selling Pringles potato chips and Danone yoghurt nearby, but why Thailand visitors would eat pizza and cheeseburgers is beyond me. I started carefully at hotel restaurants for fear of upsetting my stomach, but when nothing happened I switched to random Thai places, and as nothing continued to happen I started sampling from street vendor carts. No problem. I avoided tap water and unpeeled fruit though. The pineapples and mangos are wonderful, unlike any I have ever eaten before, but OJ is poor - polluted, excuse me, fortified with artificial flavors and color. There are 7-Eleven stores all over Thai cities, and they count as upscale shops here, even air-conditioned and full of Western wares. Chiang Mai is an excellent starting point for excursions into northern Thailand, and there are travel agents everywhere offering them. The point where Thailand, Laos, and Myanmar (formerly Burma) meet is called the Golden Triangle, a supposedly beautiful area but rather far away, and an excursion takes many days so I chose something closer to Chiang Mai. I ended up with an excursion by Panda Tours (phone 278296) that included elephant riding, river rafting, and hiking up some hills to visit mountain tribes and see waterfalls. 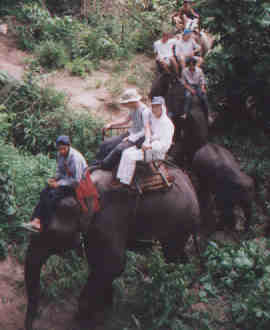 Elephants are used as work animals in rural Thailand, carrying timber or doing heavy farmwork. They are a tourist staple too. They mount a wooden saddle on an iron frame on the back for two people to sit, while the driver, a small boy in my case, sits right on the bare head of the elephant, guiding it with his feet behind the elephant's ears. Elephants walk with slow, pondering, pounding steps, up and down hills on narrow paths. We rode for an hour until we got to the end of the trail. From there, we continued hiking up the hill to visit hill tribes. That's what they call them; they are really immigrants from adjoining poorer countries trying to get Thai citizenship. I was assured that they don't mind being gawked at by tourists... They live in primitive huts built from roughly cut wood and palm leaves, but not so primitive that they wouldn't sell Coca Cola to thirsty tourists or watch TV. We visited several; it was a fairly long hike involving several shaky wicker-and-bamboo bridges like the one on the left. We also passed some small rivers and a waterfall, where some people went swimming. The water is very warm, but in some places, especially still water, one can catch quite interesting diseases such as small worms that burrow through the skin and swim to the liver where they live happily everafter, so I skipped that opportunity. 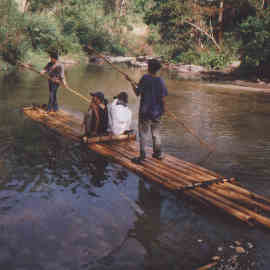 Rafting on a small river through the jungle is great fun. It's not a jungle in the Tarzan sense, but there are dense forests, mangroves, ferns, and reed; with birds and small animals everywhere. Snakes, too; we saw one. They are small but poisonous. We were warned that it would get wet, but compared to true white-water rafting it was slow and quiet. This excursion was certainly worth its cost ($20). It was fairly short, but travel agencies in Chiang Mai offer anything from half-day to week-long tours, from seeing some wat somewhere to hiking through the forests of the Golden Triangle. Some day I'll come back and spend more time here. Chiang Mai was the best part of the entire trip.